Dracula 2000 flew right under my radar. I don’t recall seeing a single trailer for the movie or hearing anything about it. My introduction to the film came in the form of a VHS screener that was sent to the Blockbuster I worked at. Back in the video store days, the film companies would occasionally send movies out early for employees to watch. This helped educate the employees and encouraged them to recommend the films to customers. I was working when the screener came in, and after seeing Wes Craven’s name on the front cover, I immediately put my name on it. I went home and watched the movie that night and really enjoyed it. It was a modern take on the old Dracula story that seemed to work well for the time it was released. A group of thieves unknowingly release Count Dracula, who heads to New Orleans to find the daughter of his arch nemesis Van Helsing. - The movie oozes with late 90’s cool. It captures the fashion, vibe, and even absurd product placement. Did anyone want to visit a Virgin Records after seeing this? -Vitamin C can act! So, Vitamin C was a two hit wonder in 1999 whose hit song, The Graduation Song which was a very popular in high schools across the country. Horror films from this era loved to cast hip singers/rappers and this was met with mixed results. Vitamin C is one of the ones that actually worked out well and it’s a shame this role didn’t lead to better opportunities. -I was shocked a few years ago to see that Dracula was played by the then unknown Gerald Butler. I was pleasantly surprised at how good he was and well he plays the dark, mysterious figure. He was a very effective Dracula, something I couldn’t see him playing in 2017. -I remember loving the Christian storyline in the film and found it to be a fascinating twist, however, this isn’t nearly as impactful when watching now. -The casting of this movie was insane. They just cast anyone with any sort of popularity and who was available at the time. You had Jeri Ryan from Star Trek Voyager, the before mentioned Vitamin C, and Danny Masterson from That 70’s Show. The remaining cast Omar Epps, Jennifer Esposito, Christopher Plummer, Nathan Fillion, and Sean Patrick Thomas were all well rounded and fit with in the movie. -Great late 90’s soundtrack featuring the likes of Disturbed and Linkin Park. -Surprisingly, the two actors that just didn’t seem to really fit in this movie were the two leads: Jonny Lee Miller and Justine Waddell. This movie could have used one of those big name TV teen actresses that Dimension Films liked to cast. -The third act actually bogs the film down. Prior to it, the first two acts come across almost like a Buffy The Vampire Slayer episode without the humor. I think this film works best when Dracula is stalking and not actually around in person. - I actually forgot that this film was not directed by Wes Craven until my most recent viewing. 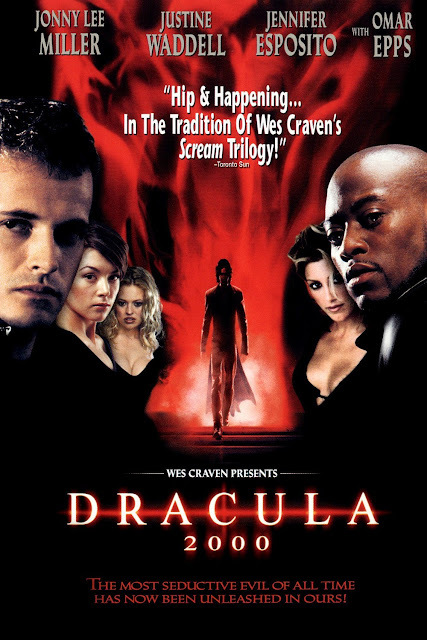 His name was so heavily advertised that you’ll find this movie on Hulu under the “W”s for Wes Craven Presents: Dracula 2000. -One of the writers Joel Soisson, wrote Trick or Treat, the 80’s heavy metal horror flick. -The Weinstein’s bought this film just for its title Dracula 2000. -Two sequels were made: Dracula 2 and Dracula 3 which were both directed by Dracula 2000 director Patrick Lussier. I was a little intimidated going back in to watch Dracula 2000 here in 2017. The film surprised me though; it didn’t come off too hokey and for the most part is a decent flick. I think the Weinstein’s knew they put together a ho-hum film and that’s why they attached Wes Craven’s name to the box, just to try and give it some credibility. I like the opening scene and the middle of the movie, but I think the biggest flaw of the film is the lead actress Justine Waddell who is just not sympathetic. As she begins to dominate the screen time towards the end of the flick, I feel the movie stops being as effective and ends much weaker than it began. I think fans of Dracula who don’t mind something a little different will enjoy this flick. Fans of the late 90’s teen horror (although this is very debatable on whether or not it’s a teen horror film) should also find a few things to enjoy. However, as a film, I’d say this is a 5.5 out of 10 and a low priority rental. Recently, I talked about my fondness for the original Final Destination. I felt like the movie ended well enough and it didn’t need a sequel. Of course, the first movie was successful and it’s a horror movie, so a sequel was green lit and came out three years later. I picked it up on DVD mainly because it had Ali Larter in it. I was/am a fan of her acting and really was interested in seeing where they were going to take her character in another movie. Of course, Clear isn’t the main character of the second film, but AJ Cook’s Kimberly Corman is. AJ Cook is another actress I became a fan of because of her early work including Ripper (which will be covered in the future) and Out Cold. I enjoyed AJ’s work as the lead actress and found the movie to be equally as entertaining as the first Final Destination, just in a different way. The tension from the first movie was cut back, and in its place was gore and some humor. In all honesty, it works well. I think the reason this franchise holds up so well is that it takes death seriously, but not itself. Of course, that’s not to say nothing in the film is scary. In fact, the opening scene may go down as the most terrifying and scarring sequence ever put on film. It’s rare to find someone whose seen it and not been affected by it all these years later. In a way, I feel like it was my generation’s Jaws. On the one year anniversary of the Flight 180 tragedy, Death tips its hand to another person who escapes fate with a group of reluctant survivors. -I know I just touched on it, but it goes without saying, the opening scene is brilliant. It’s well made with practical effects and CGI that works and holds up all these years later. It’s realistic, scary, and creates a phobia of log trucks for anyone who ever sees it. -AJ Cook (Ripper) was brilliant and I liked how much Clear (Ali Larter) had developed and come out of her shell since the first film. Tony Todd’s (Candyman) cameo was great as well. -Some of the deaths are taken lightheartedly and I both liked that and hated it. It allowed for the audience to laugh, which was nice, but it also appeared the director didn’t think he could pull off these deaths without resorting to humor, which was different from the first film. -The other death scenes were great. There wasn’t one that I didn’t enjoy, however, many of them were quite impractical and not scary. -The supporting cast was not nearly as strong in this film. In fact, I felt like Kimberly’s friends in her SUV would have been more entertaining to follow than the group of survivors. Michael Landes really felt out of place in this film. -Devon Sawa’s absence was only made worse by mentioning him and showing off his newspaper clipping. -The tonal shift of the franchise was something I enjoyed, but also hated. It was nice to laugh at times (especially the final death) but I would have liked to have experience that dread that the first film conjured up in me. -The Stonybrook Sanatorium where Clear resides is the same hospital used in Halloween Resurrection. -Devon Sawa was originally scheduled to return as Alex, but a conflict in his contract made production go on without him. Final Destination 2 is a great addition to the Final Destination franchise, even with the humor and tonal shift it brings. It’s not nearly as effective as the first film when it comes to feeling like “This could happen to you” with exception to the opening highway scene which is by far the greatest moment in this entire franchise, and one of the greatest horror moments in general. I give Final Destination 2 a seven out of ten and say it’s a high priority rental.